← Rizal Avenue – A street to love. 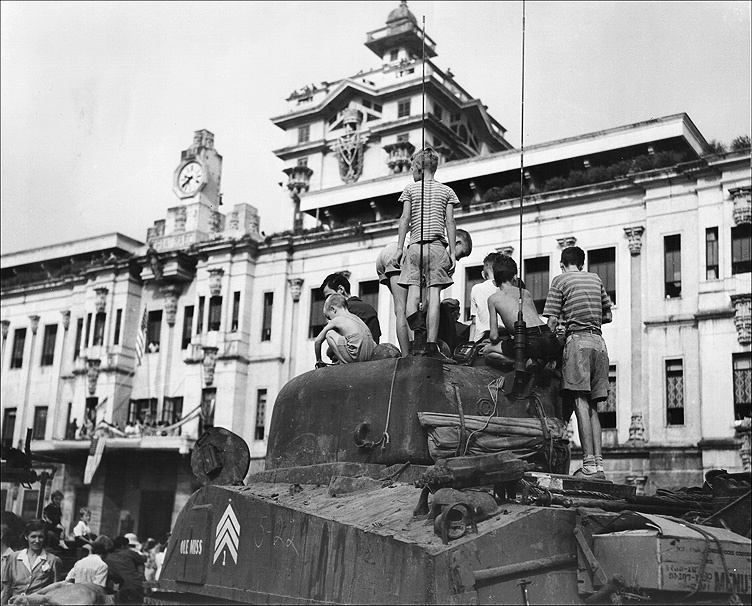 It was 70 years ago that the American, British, Canadian and other Allied families, almost 4000, were liberated from their internment at the University of Santo Tomas after over three years of deprivation and systematic starvation at the hands of the Japanese Army. Their captivity started in January 1942. 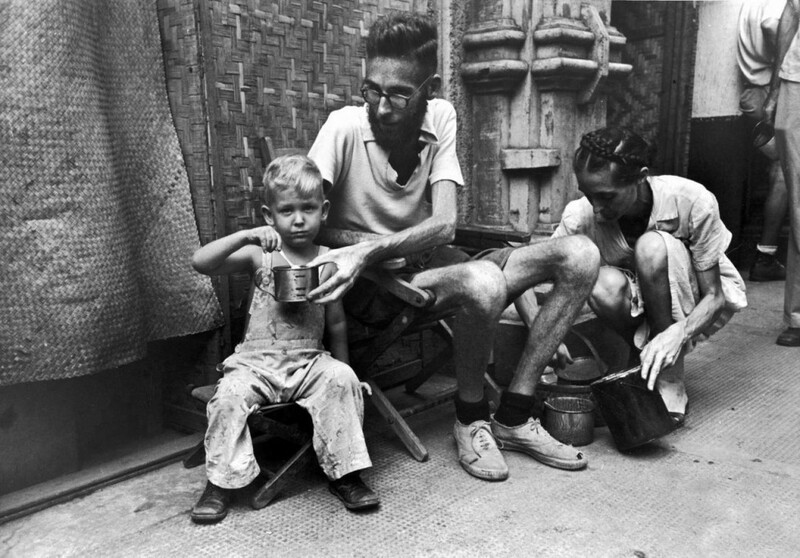 They were crammed into several buildings and eventually spread out onto the university campus living in cramped rooms, cots and beds infested with lice, and bathrooms that were meant to service only several hundred daytime students; living in shanties which they had to build themselves. Men’s dormitory room packed with internees – taken by internee Jerry Sams with smuggled camera. Shanties built by the internees located in the Patio area. My wife, Michelle and I were privileged to hear the stories of over two dozen of the surviving internees during our research to document this incredible story for our film, Victims of Circumstance. I dedicate this article to all of the civilians who suffered through this ordeal at the Santo Tomas Internment Camp; over 600 of whom died or were killed during this dark period of American and Filipino history. My dear friend, former Marine Robert B. Holland was there with the Flying Column that momentous evening. His description captures the event of liberation best. I quote directly from his book, “The Rescue of Santo Tomas Internees – The Flying Column: 100 Miles to Freedom”. Here’s Bob on our flight to Manila in 2005 for the Santo Tomas Internment Camp reunion. He has since passed away. 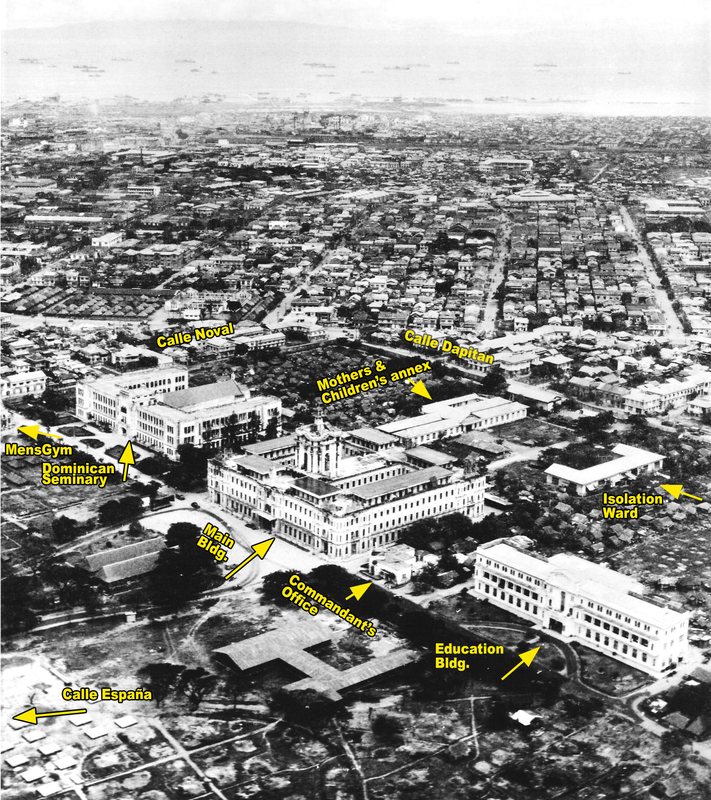 On Saturday, February 3rd, 1945, it was nearly time for the evening roll call at the Santo Tomas Internment Camp in Manila. Among the 3700 emaciated and tattered men, women, and children who had been prisoners of the Japanese there during the three long years since the Fall of Manila, hopes and spirits were high. 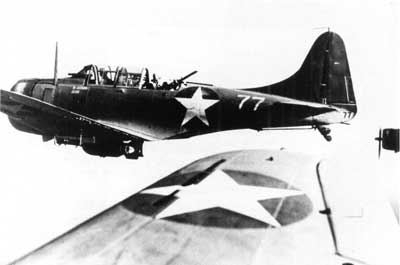 American aircraft had been seen and identified by the internees several times during the past few days. Of course the planes were newer models than anybody in the camp had ever seen before, but there was no mistaking the American markings. And if American planes were coming that close, maybe the Japanese were planning to give up Manila as they had been forced to give up Leyte. The change in attitudes of the Japanese prison staff had been noticeable. Discipline was relaxed. The internees knew that meant something was happening, and that things were looking better for them all of the time. Bob Holland stuck in his jeep while the rest of the 1st Cav wait patiently. Battlin’ Basic is in the background. At 4:45pm, as the internees went to their quarters for the roll-call, nine Marine SBDs, dive-bombers, among those on station every day supporting the Flying Column, buzzed the prison compound so low that it seemed certain they would take the roof off of the guard tower. As darkness fell, cheering Filipinos shouting “Mabuhay” !” amid the noise of rifle shots could be heard. The roar of internal combustion motors and the clank of metal were audible through the prison windows. One internee said, “They’re our tanks. They’re American tanks !” Another said, “How do you know they’re American tanks? You never saw American tanks ! They are probably Jap tanks retreating.” There was no answer to that. Then the shanty-dwellers began to file into the Main Building. 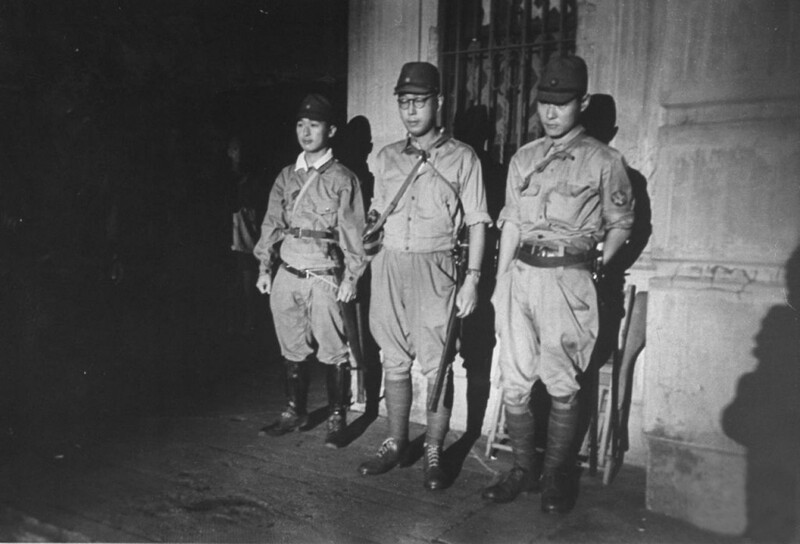 Lieutenant Abiko, the Japanese supervisor of prisoners, had issued the order. “Tell all shanty-dwellers to get into the Main Building within twenty minutes. 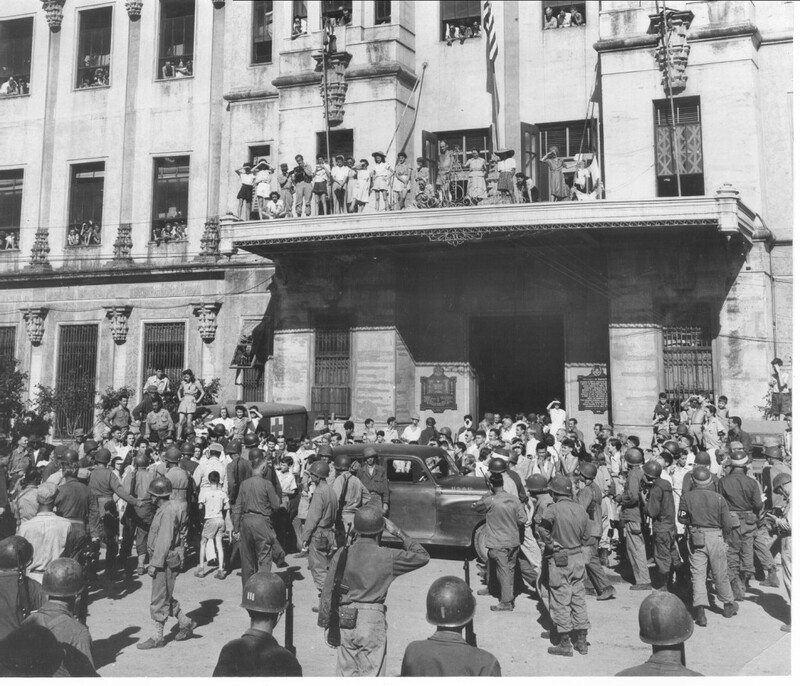 The Americans are in town.” The shanty dwellers then began to file into the Main Building. The internees listened anxiously as the firing grew nearer. Stealthy glances from the window revealed little, but throughout the building starved and wrinkled faces broke into smiles and grins. Internees so recently bowed by their long imprisonment now walked on air, hoping, yet fearing to hope, that Santa Claus was really arriving. They watched the Jap guards go to their posts. They saw two Jap trucks carrying seven Jap soldiers roll hastily out of the front gate as the tumult neared the rear of the compound. In the growing darkness the rattling threads of the tanks became the jingling bells of Santa Claus’ sleigh. Or were they Japanese tanks ? Then the tanks turned left and stopped in front of the main gate. Indistinct voices floated up to the internees leaning out of the windows bent on missing nothing. A flare was sent up. Its light showed the time on the Main Building’s clock. It was 8:50pm. Everything was quiet. Machinegunner John Hencke on the Battlin’ Basic. The internees’ horrible ordeal had finally ended. For many, it would be another few weeks before being repatriated back to their families in the U.S.
Bob Holland (standing on left) with internees and friends from the 1st Cavalry. 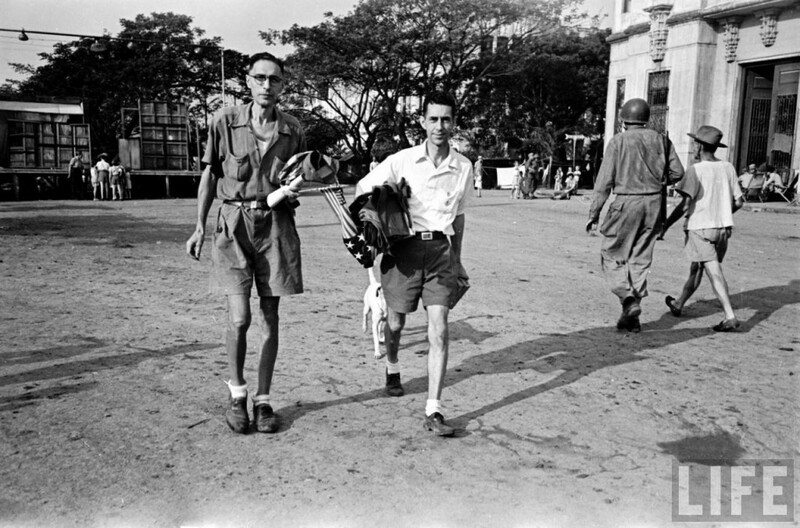 Left to Right: Hugo G. Winkler, 30, proof reader on the Manila Daily Bulletin, who weighed 135 pounds when interned, is now 87; Thomas B. Loft, 55, weighed 160, now 102; Arthur Williamson, 45, exporter, came in weighing 145, now 103; Harold B. Leney, 31, chartered accountant, once weighed 185, now 105; and David Norvell, 38, with Soriano Bros., who came in at 135, now weighs 95. Internees prepare to welcome Gen. MacArthur – Feb. 7, 1945. 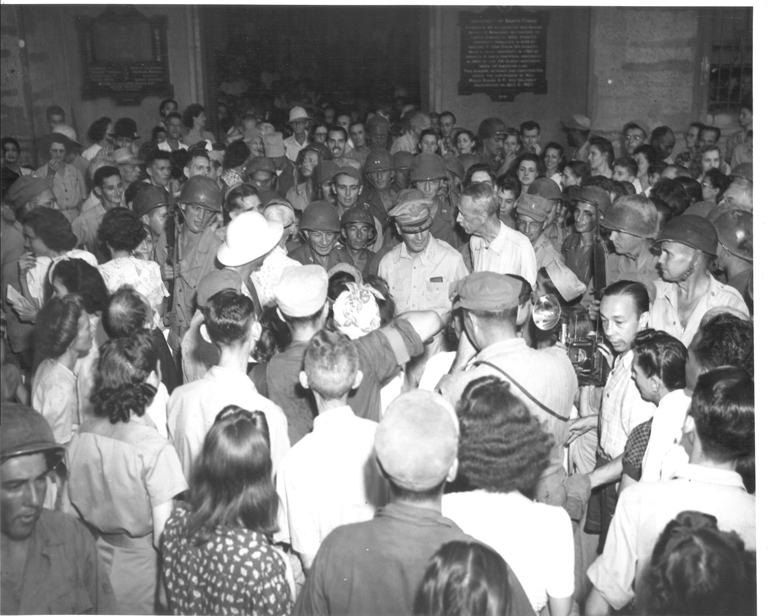 Internees crowd around Gen. MacArthur – the man of the hour. 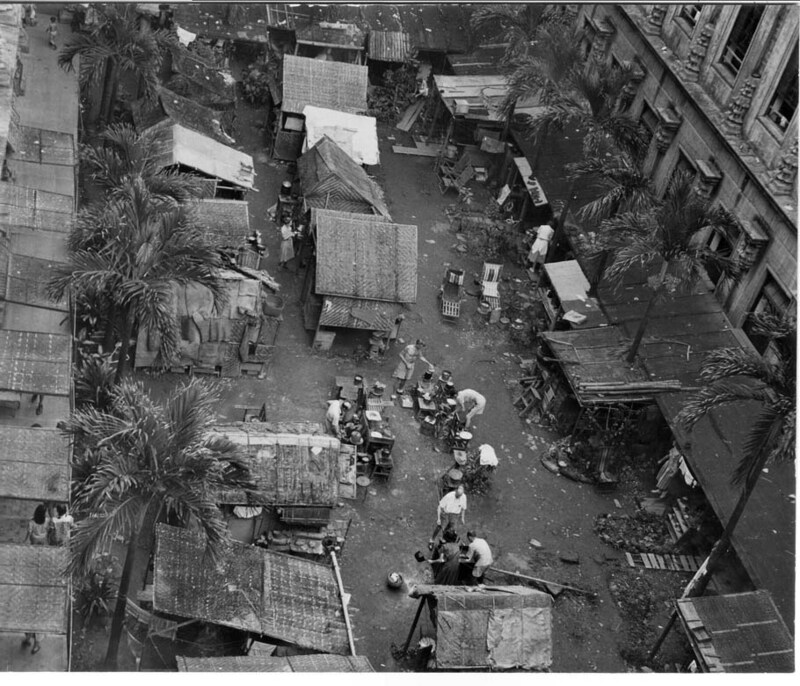 For some it would mean years of rebuilding homes and businesses in Manila that they lost through the ravages of war, and for others a time of grieving for family and friends that did not survive. 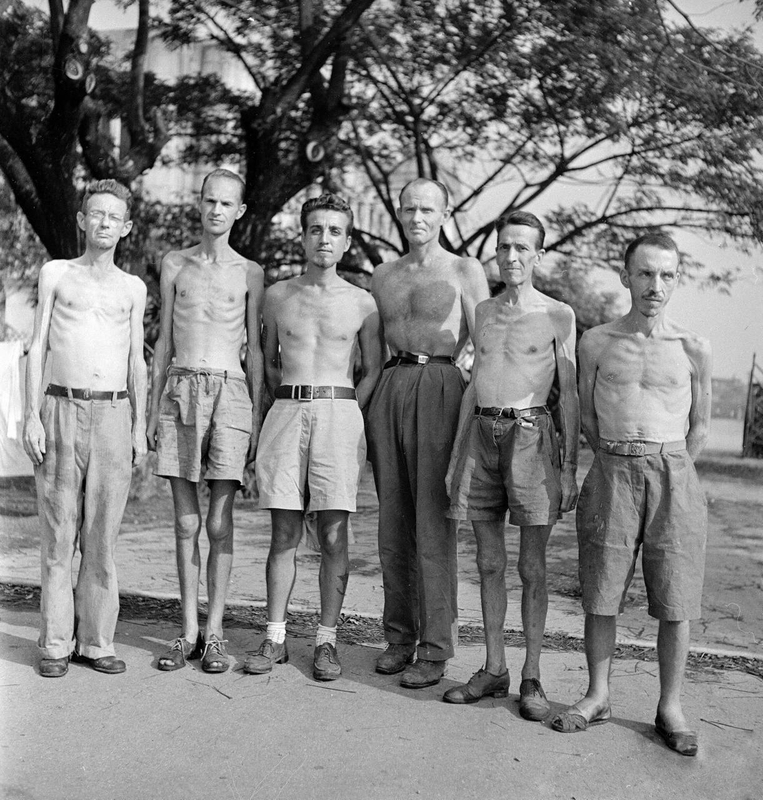 A few internees were killed after being liberated by the Americans during the days that followed when the Japanese continued to shell the camp. 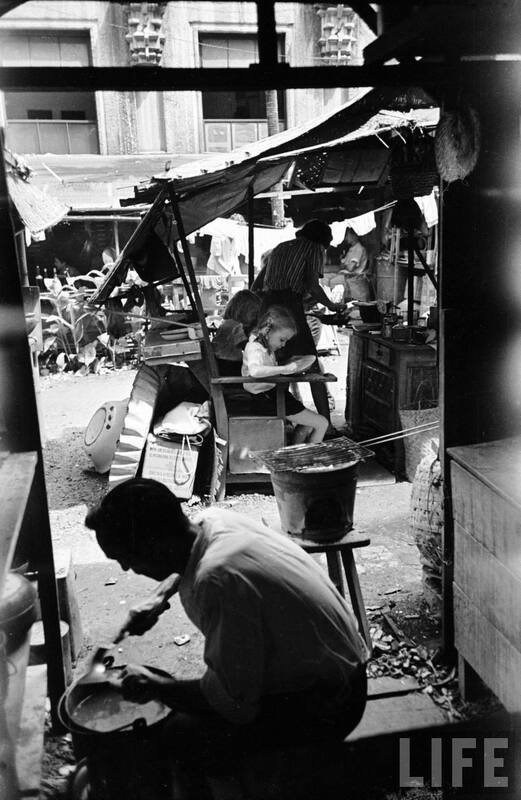 The Cotterman family established in Manila since 1900 were part of the city’s long term American families. Below, Nana Cotterman is escorted out of camp by her son, Charles Butler (right). Kids climb aboard the American tank. British citizens find their way home after liberation. 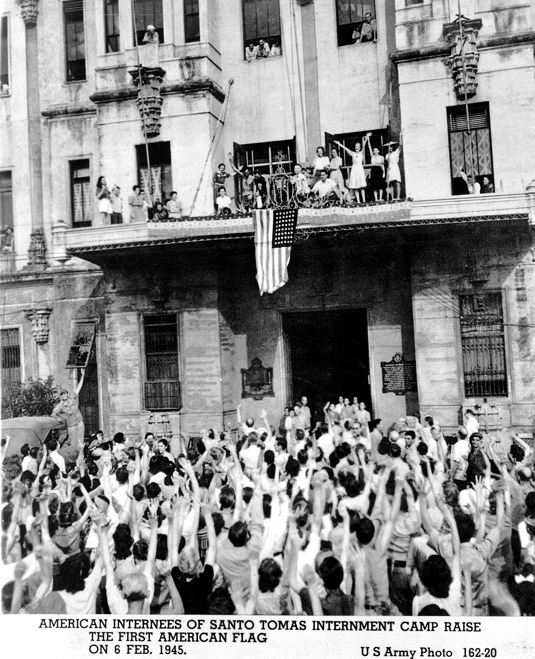 As they left their confinement, their thanks went out to the many Filipinos who helped them survive their three year internment. Filipino friends, relatives, business acquaintances, and even employees who brought food, medicines, support of friendship and acts of kindness without which their plight would have been utterly hopeless. Internees waiting at the package line for food and goods provided by friends from the outside. 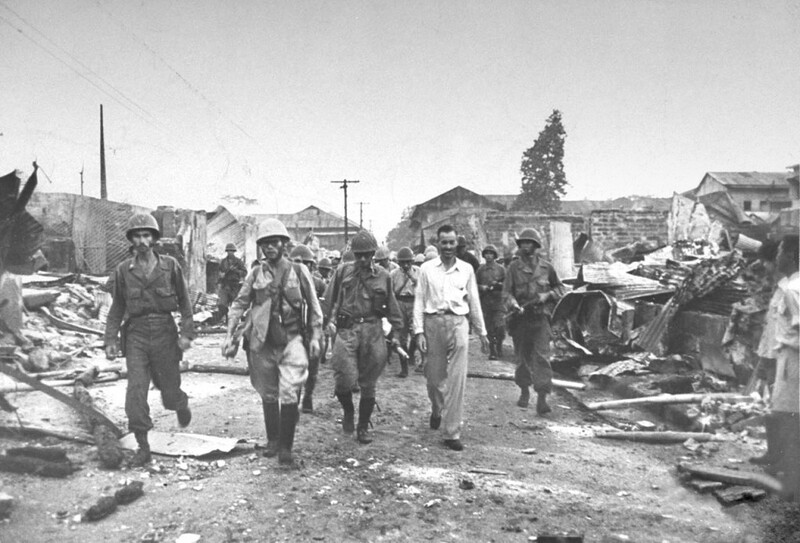 Liberation was bittersweet, as while most of the internees were freed, there was an interminable wait when the Japanese held men and boys hostage in the Education Building for several days. 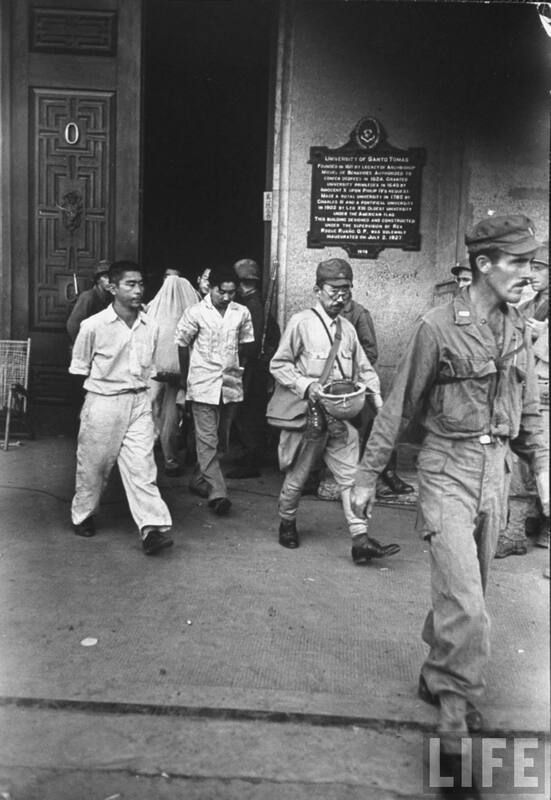 The Japanese finally negotiated a surrender and were allowed to leave the campus accompanied by the U.S. military and one of the internees, Ernest Stanley who acted as an interpreter. They were marched off and released. Rumor has it that guerillas ended their fate quite abruptly. 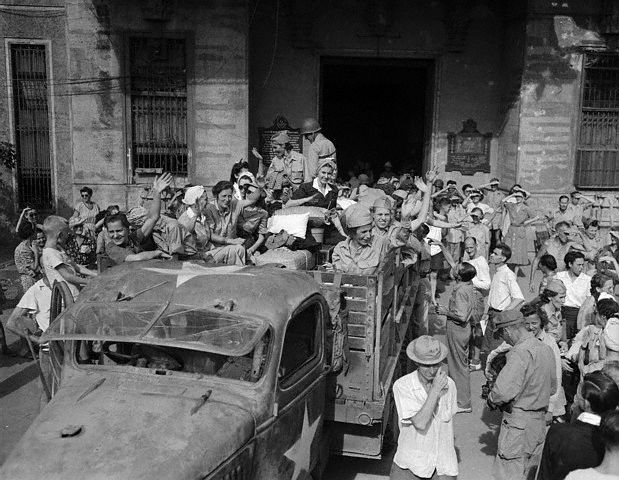 Japanese soldiers being led out of Santo Tomas Main building. All profit is donated to Internee and POW organizations. 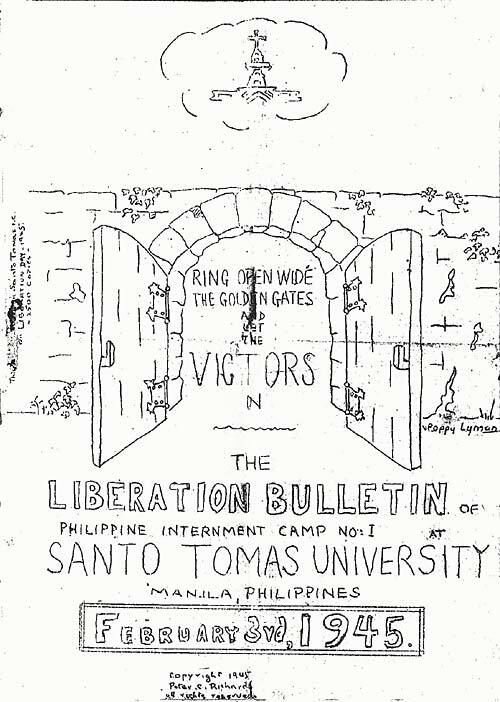 24 Responses to Santo Tomas Internees Liberated 70 years ago. 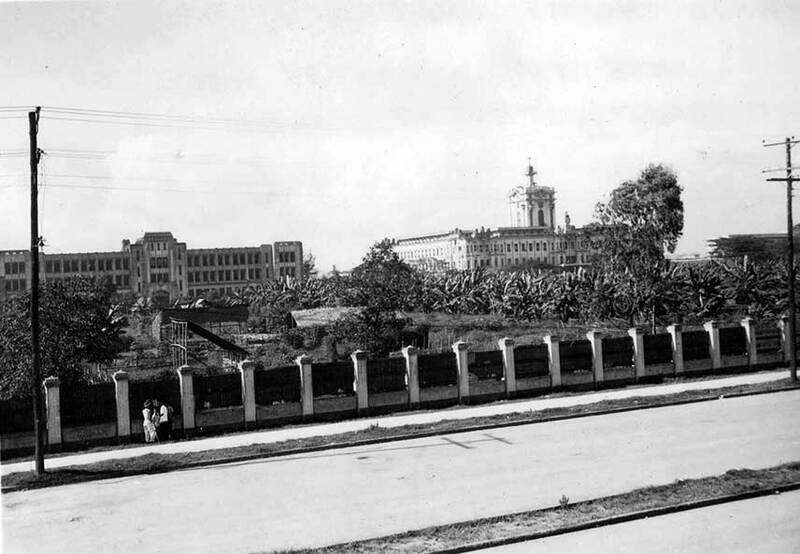 My mother and her family were interned in Santo Tomas – The Crawfords. This was wonderful. I am sharing it with my cousins. My step-father was one of the soldiers from 1st Calvary to liberate the internees. He came back to the Philippines to work within the Tobacco industry and met my mother eventually marrying her. Thank you Lou for posting all of these pics. I haven’t seen a lot of them. Wish my family were alive to show where their shanty was. I’m pretty certain my step-grandfather on mother’s side was there because he was American. My mother and grandmother were Filipino and so were not interrned. My great-grandparents, who owned a rice plantation in Dagupan, were Spanish and since Spain was neutral they were not interned either. As luck would have it Andy Butler forwarded your blog on the anniversary of the Santo Tomas liberation. Luck because my father is in the photo of men’s dormitory!! He’s the one in the lower left corner playing cards, one of his memories that I included as a scene in my biographical novel PHILIPPINE ODYSSEY. Can you provide me with a copy of the photo, or let me know who has it that I can contact for a copy? 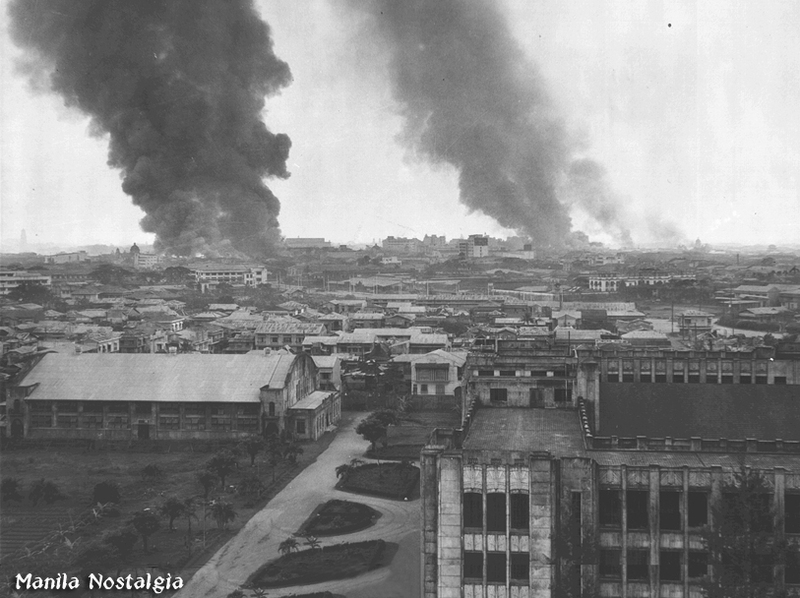 My father, August Quesada, was a teenager living near Santo Tomas during WWII. He used to go visit the American prisoners and talk to them thru a fence. He’s now 86 years old. I’ve forwarded him your article in hopes that he might recognize some of the people he’s been telling us stories about for decades. He became an American at age 33 and now is retired in Florida, btw! 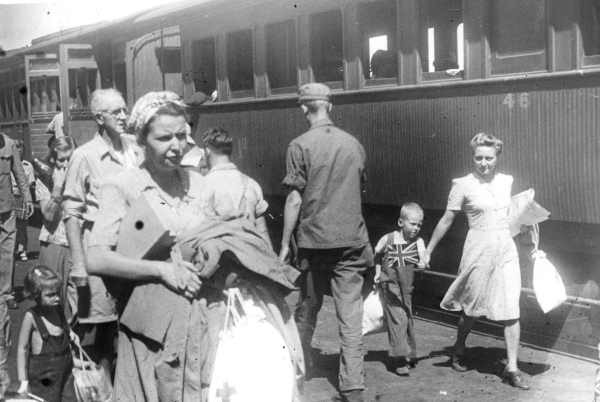 So many of the internees owed their survival because of the kindness and generosity of the Filipinos who continued to support their American friends even at the risk of angering their Japanese captors. I admire your father’s character and faith of human spirit. Lou, I have an older yoga friend who I accidentally discovered was a prisoner in Santo Thomas; I also want to forward this link to members of the Gibbs family, who were interned. Could you send it to me via email? I like Steve, had a Filipino mother, so she was not interned. My father, however was interned in STIC from 1944 to 1944, when he was transferred to Los Baños, Laguna where he was liberated on Feb. 23, 1945. He told me many stories of that period. Thanks for this, Lou. My Aunt was one of the army nurses captured and interred in Santo Tomas, she is on the back of the truck with her head down. She was head of nurses at Swedish Hospital in Seattle until her death in the ’80’s she was a remarkable woman. Thank you for sharing! Swedish Hospital is one of my favorite med centers. We live in Sammamish and I’ve had to go to their Issaquah hospital several times and received excellent care. Thank you for your comment. William Gardiner was my father, Clifford was my grandfather, Dorothy and Betty were my aunts and Barclay was my uncle (all are now deceased). Pacita (my grandmother) died before the war and was not in Santo Thomas. The entire Gardiner clan was transferred to Los Banos and was liberated from there. I have been thinking about writing a biography of Clifford, he had a fascinating life. I would love to get in touch with you. My aunt Sr. Mary Fidelis (Elsie Dorsch) was interned at Santo Thomas. I remember her stories when I was growing up –after her release of course and when she returned home for a visit. 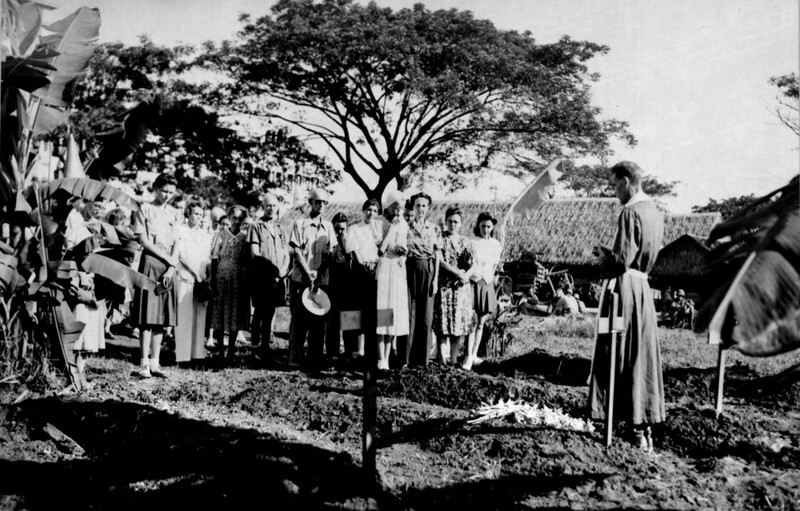 She served the Maryknoll mission her whole life–in Baguio and Yap…..
My mother, grandparents, and uncle were interned there. The Hollands. I think my grandfather, Albert, was on the camp’s executive committee. They never really liked talking about their experiences with me, although I remember my mother telling me about getting a ride on a tank when they got liberated. Thank you for this work you have done. Bert Holland was on the Hannibal Victory with Chris, Valla, Christian and Valerie Larsen. My father Lt. Robert E. Lee, commander the tank Ole Miss, the one with picture of the kids climbing on it. My thanks to your father and all the other servicemen who liberated the Philippines. They are all held in high esteem.